Add 3/4 cup juice and garlic to stockpot; bring liquid to a boil. Reduce heat; cover tightly and simmer 2 3/4 to 3 1/4 hours. Add apples and cranberries to stockpot. Bring to a boil. 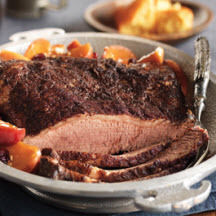 Reduce heat; cover and simmer 20 to 25 minutes or until brisket and apples are fork-tender, stirring and rearranging apples once during cooking. Combine remaining 1/4 cup juice and cornstarch; stir cornstarch mixture into apple mixture. Bring to a boil, stirring constantly. Boil 1 to 2 minutes or until mixture has thickened, stirring frequently. Trim fat from brisket. Carve diagonally across the grain into thin slices. Season with salt and pepper, as desired. Serve beef with apple-cranberry sauce.